Our hotel ( the Ritz Portman where the SF delegation to San Francisco week at Expo 2010 is staying) is across from the 50's Russian style Exposition Center - a vivid illustration in the world of Expo 2010 of how much has changed in China. We have today to go and see a bit of Expo - we'll keep you informed as best we can, which is not SO easy. Chanticleer's little corner of the blogosphere ( us and 275 million others around the world) is blogger.com/blogspot - that's how we post our blog. Come to find out that it is blocked in China now. It wasn't when we were here last year. Which means that we can still post to it by email, but means also that we can't go look at it to correct, add, edit, see if that's what we meant etc. - so we'll have to get it right in the original email. That lack of convenience is not the point though; It's a very strange feeling to be blocked from seeing your own blog! And that's why yesterday's post was incomplete - we sent it over to blogger, where, we hear, it was posted, but we couldn't go there and add text. SO - yesterday - we flew here with 140 other members of the San Francisco cultural delegation to San Francisco week. Mayor Newsom, presumably Senator Feinstein, former Mayors Brown and Jordan, and others are arriving today for events at which we won't be present. On our plane were Samoan and Irish dance groups, the Northern Lights children's choir from Oakland, 40 members of Glide Memorial's Choir, the Bridge instrumental chamber group and us. All the other groups will be performing at a community center tomorrow and at the Expo on Sunday. Our itinerary is a bit different ( which means that we won't have the pleasure of seeing the dancers dance) - we will do two exchanges with choirs tomorrow - at Shanghai Normal University and at the Shanghai Conservatory. Then on Saturday the non-dancing people perform at the big SF Gala - we just found out yesterday that we will sing one song on that occasion. 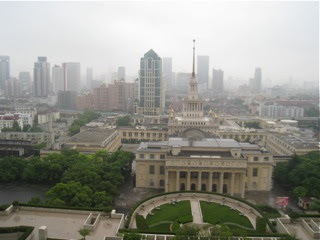 Then Sunday we go to Shenzen for a concert in the concert hall. Our travel agent La Fugue ( in Paris) organized a patron tour to China which takes in our visit to the Conservatory and the Gala and then goes on to Shangri-La and Guilin. A number of French people will be joining our board members Kathy Henschel and Ann Goodbody, and Florence Lidell. We'll see them for dinner tonight at the Hyatt on the Bund. More soon. It's HOT here!